Recently hosted a birthday party and having a dozen paper plates left over? Don’t throw them away. You can make an eye-catching paper plate parrot. Yes, that’s right, an absolutely eco-friendly and kid-friendly way of re-utilizing the paper plates. I often see mothers struggling to keep their fidgety preschoolers productively engaged. My answer to them is, “get crafty” (pun unintended). 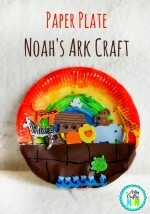 Crafts engage young kids like no other activity and help them fine-tune their gross motor skills. 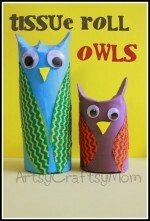 So, during school breaks, when the kids drive you up the wall, pull out the colors and chart papers and get down to making some fantastic spring crafts. Cut a circle (4-inch wide ) from the red construction paper for the head and a 1-inch circle in white paper for the eye. Use the yellow paper for the comb & beak. Outline it using a black marker. Cut another piece of red or yellow construction paper for the tail feathers and color it using watercolors & dot-to-dot markers. Colour the paper plate in various bright colors. This will form the body of the parrot. We colored the center in a different color and the sides of the paper plate in a different color. Then, we used the dot-to-dot markers to add dots. We used Rainforest colors – Red, Yellow, Green & Blue.. Painting in circles and adding more dots along the way. The advantage of using a Dot marker is that they have a large sponge tip that will never dry out, and makes a perfect dot every time. These markers have bold pigments and bright colors that dry fast. Let’s get the parrot’s face ready now: Stick the beak & comb on the red circle using glue. Stick the white circle for the eye. Using a black marker, outline the beak and add a black circle for the eye. 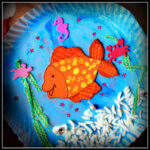 Use a stapler and secure the head & the tail to the paper plate. 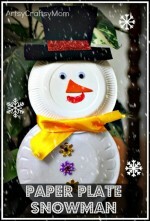 Cut the brown foam into a claw and paste at the bottom of the paper plate. Glue an icecream stick at the bottom to make it into a puppet. A stunner, right? I tried this at a small workshop and all the kids loved it. Each child got to use the colors of their choice & all the multi-hued parrots looked amazing. Now that you’ve unleashed their creativity with birds, get them hooked on to more interesting crafts like a rocking spring bird or Origami Bird magnets or a handmade clay birdhouse bookmark. Don’t forget to write to me about how they liked making these! Love the colours. It’s beautiful. This is SO colorful!!! I love how anyone can make this wit materials they have at home. Wouldn’t this be cute in a puppet show? These are adorable! They turned out so colourful and pretty! GOOD IDEA WILL LOVE TO MAKE ONE. PLEASE GO THROUGH MY BLOG. 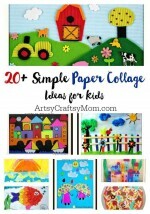 I love your papercrafts for children. This is a perfect project for my nephew. I was also looking for some Valentine’s Day papercraft ideas, but couldn’t find any on your website.